What jobs has Apple created? It turns out Apple has an answer to this question: 514,000 in the US. 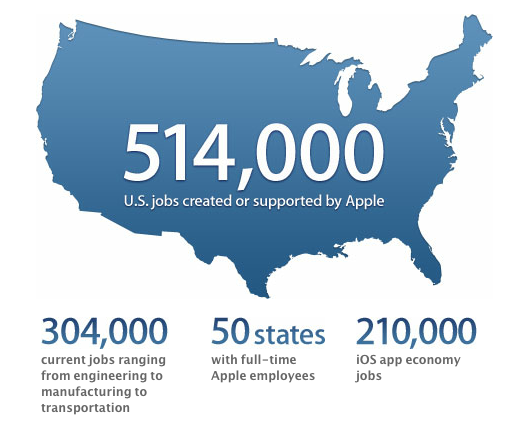 304,000 of those are either jobs at Apple or at companies that supply them. Another 210,000 are iOS app economy jobs but let’s face it, those aren’t likely to be full time. Joshua Gans, a professor of strategic management at the University of Toronto, says the new job estimates are fairly meaningless because it is impossible to assign responsibility for service sector jobs to specific companies. “You have to take it all with a grain of salt,” he says. Yes, I agree it is hard but I said quite a bit more . Specifically, analysis could give us a clue as to Apple’s impact. Here is how I thought about it. Strictly speaking if Apple were wiped from history, most of those people would still have jobs but somewhere else and, by revealed preference, not as good jobs. So from that perspective, Apple are massively overstating their job creation. But this is because the definition of job creation is fairly meaningless. But stepping back what Apple are claiming is that their innovations have generated new products that have created or supported those jobs. From that perspective, however, (especially with the qualifier of “support”), 514,000 is a massive understatement. Consider the iPhone. That has spurred new activity. For one, it forced AT&T to dramatically upgrade its network. That likely changed many people’s jobs. Then it caused competitors like Google, Microsoft and Motorola (focussing on the US) to increase investments in R&D and their own manufacturing in order to compete with Apple. One suspects that once you take that into account, then the US jobs that can be somewhat attributed to Apple innovation are much higher than what Apple have claimed. It’s a little bit like saying that since 27 million people eat at McDonalds every day, McDonalds keeps 27 million people from starving. The truth is a bit more nuanced –– and hard for journalists to understand. I take this to be academicese for, since they are working at apple, the job at apple is their first choice. The trouble with this is, we don’t know what jobs would be present in apples absecne; this statement is true only if those counterfactual jobs are are the same as the non apple jobs in an apple world. And what about the anchoring effect ? I’m sure you know that if apple picked a random number, and *told* us it was random, we would nonetheless frame our thinking around that number. and what about the jobs lost to pay for exspensivve iphone contracts – if people are spending more on their phones, are they cutting back elsewhere ? I think this assumption is wrong. A lot of iOS App developers are hired full time (the guys developing the facebook apps are not sitting in a basement). Additionally, iOS app developers have an ave salary of $81k (http://www.simplyhired.com/a/salary/search/q-ios+developer) which exceeds the average “developer” salary (http://www.simplyhired.com/a/salary/search/q-developer) (which also seems to match anecdotal evidence that iOS developers are in heavy demand). If iOS developers are opting not to work full time, it is most likely because of personal choice rather than lack of availability. Pingback: How Many US Jobs Has Apple Created? Who Cares? | My Job Advice - simple job employment advice - find a job today! Pingback: Digitopoly | Does the app economy need institutions? Previous PostPrevious Should HBO sell an unbundled product?